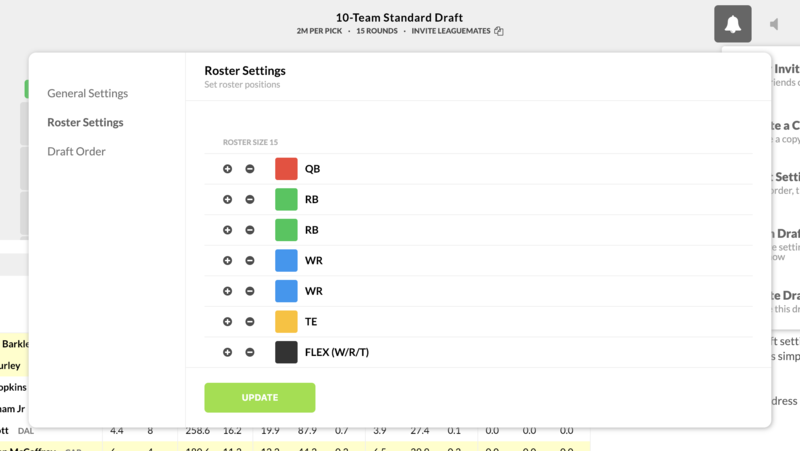 How to add compensatory picks in a fantasy football draft? You'll be able to add compensatory picks to a team on draft day, but you'll have to make some custom adjustments. Usually, leagues will give compensatory picks to new team in dynasty leagues or some other use case. First, add additional rounds to the draft based on the number of rounds where you'll be adding / awarding compensatory picks. For example, if you're planning on a 10 round draft and will be assigning compensatory picks after round 4 and 5, change the draft settings so that it's a 12 round draft. You can do this by changing the roster settings to the draft. Add two additional roster bench slots - it doesnt matter what you add. You'll change it back to your normal settings at the end of the draft. When it is time to assign compensatory picks at the end of the round, pause the draft. Then, go to the bottom of the draft board and assign the drafted / selected player to the team. It'll look like the image below. Finally, resume the draft and continue the draft as normal. At the end of the draft, make sure to adjust the roster settings back to the original league settings. We'll look into automating this use case in the future, but for now, this is the best way to work around it.